The cost of a gallon of gas jumped over 7¢ per gallon during the past week, according to the latest weekly survey from the U.S. Energy Information Administration. The EIA’s weekly report showed prices in all regions soared anywhere from 6¢ to over 10¢ per gallon. A conspiracy of factors has pushed the average U.S. price of a gallon of unleaded gasoline to $3.38 per gallon, their highest levels since the start of October 2013, when prices on a national level were at $3.37 per gallon. The price increases are due in part to wicked winter weather, which has also caused a surge in natural gas prices. The increase in global demand has also contributed to higher prices on futures markets, namely the all-important West Texas Intermediate, which had been flirting with the $100 level for weeks. The WTI closed above $103 Wednesday afternoon at $103.31. The greatest overseas demand has come from China, which has offset a renewed availability of crude oil in the United States. Oil refineries in the U.S. are struggling to keep up with demand for natural gas, heating oil, and renewed global demand. 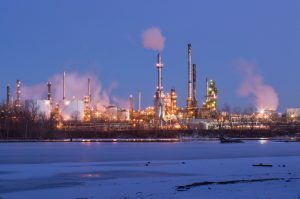 The price of oil futures could go even higher as global demand continues to increase, and refineries are having particular difficulty keeping up with natural gas and heating oil demand amid a lingering winter across much of the United States. Another blast of cold air is expected at the end of the week and through the weekend, which will further strain refineries and suppliers already struggling to keep pace with consumers’ needs. Add to that the growing demand for oil in China, and a perfect storm of conditions exists to push the WTI Crude Oil index up to, and perhaps past, its 52-week high of $104.52, a level that was seen during the Syrian war scare crisis during late July and early August 2013. Late July prices peaked near $3.70 per gallon, a rate that is already perturbing drivers in many states, particularly California. Prices on Monday were measured at almost exactly that rate across the Golden State, which dragged the broader West Coast gas price average up to $3.57. Take California out of the equation, and the price of fuels on the West Coast is only $3.36 per gallon, just under the national average. The news for truckers was not nearly as bad as for drivers of gas-powered vehicles, but prices of diesel fuel in nearly all regions did increase during the past week, pushing the national average of a gallon of diesel to $3.99. Many areas, particularly New England and the Central Atlantic states, are paying considerably more, however. Prices in New England average about $4.37 per gallon, and the cost of diesel is about $4.36 per gallon across the Central Atlantic states. However, prices in each of those regions remained mostly stable during the past week, while increases affected most other regions. 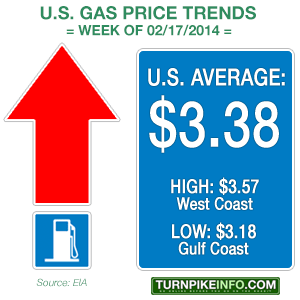 California and the Gulf Coast also enjoyed stable prices during the past week. Despite what seems like a gloomy gas price report and forecast for American drivers, the price of fuel is down substantially from 2013 levels. At this time last year, the price of a gallon of unleaded was 37¢ higher, which would translate to about $5.55 more for every fillup, for a 15-gallon tank. In some areas, the price of gas is as much as 41¢ per gallon cheaper. But the numbers for truckers are more mixed. In some regions, like the West Coast and Gulf Coast, the price of diesel is down 30¢ and 28¢ per gallon, respectively. But the cost of fuel in the Atlantic region is up. For truckers driving through the Central Atlantic states, the cost of diesel is over 10¢ higher than at this time last year.